Probably the second most famous beach on the island, Super Paradise is a superb gay beach situated in a rocky cove just after Paradise. A long beach offering a taverna and a couple of bars with pop music, the beach is also clothing optional and is accessed by road or by caique. Mykonos Super Paradise Beach. It's only noteworthy that, while everyone is after Paradise, in Mykonos we are past this; a Super Paradise is at hand! 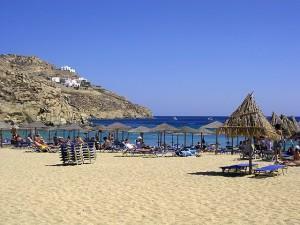 Mykonos Super Paradise Beach at broad daylight. Wait until after twilight!